A guitar and a contrabass are the first things you see when you walk into the Jerusalem home of Debby and Zohar Elnatan. You also notice the adaptive equipment for 19-year-old Rotem, who has cerebral palsy. Those two elements – music and a child with special needs – are dominant threads in the tapestry of the five Elnatans’ lives. When ISRAEL21c came to visit, Debby Elnatan was still the center of global media attention following the April 7 launch of the Firefly Upsee (http://israel21c.org/social-action-2/israeli-moms-invention-gets-cerebral-palsy-kids-walking/), a novel co-walking harness based on a contraption she invented when Rotem was two years old. CNN Turkey and a Brazilian television crew interviewed her, as well as an Italian radio station after a piece they did on the Upsee got 4.5 million hits. Her father taught her to work with tools, a skill that came in handy when she became the parent of a child with CP. “If I saw something Rotem needed, I would build a prototype,” she says. She is adamant that her inventions be sold online to remain affordable. The Irish company Leckey created a retail website for the Firefly Upsee and another product, after refining its design and testing it extensively throughout the UK. Each of Elnatan’s items is designed to leave the parent’s hands free and give therapeutic benefits while allowing the child to participate in family activities. Rotem’s older brother, Shachar, is a professional jazz guitarist, while 12-year-old Inbar is the one who plays the guitar and contrabass. Zohar is a guitarist and music teacher. Rotem, an aspiring DJ, entertained at a Passover party at Ilanot, his special school in Jerusalem. His mom lent some help. “We do what he can’t and he does the rest, and feels great about it,” she says. 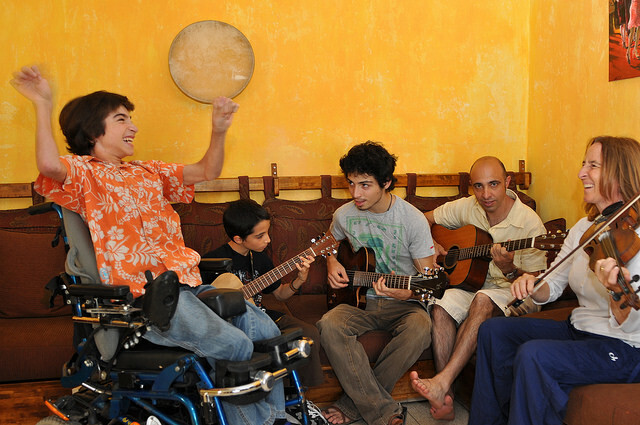 Before Rotem was born, Debby and Zohar started an evening music group through the Shekel Association, which provides community services for people with special needs with the support of JDC Israel, the Ministry of Social Affairs, the Jerusalem municipality and other agencies. This remains a weekly commitment. After 11 years of seeking a sponsor and sitting in board meetings, the Shemesh (Full Family Rehabilitation) pilot program was born to help restore family balance through play and leisure, family participation, sibling togetherness, parenting, and learning how to ask for help. Parents of older children with special needs are trained to accompany families with younger children with special needs. JDC Israel developed the program and sought governmental funding partners. A three-year pilot of Shemesh is now wrapping up in communities including Ashkelon, Rosh Ha’ayin, Baqa al-Gharbiyye and Rehovot. “We had to get the government to understand that family is the main influence and mover behind the quality of life of the child, and they need to help the entire family,” says Elnatan. Play builds special-needs children’s confidence and personality, she says. “The best advice I got was from [Israeli clinical psychologist] Aliza Vig, who recommends parents find what brings a spark to their child’s eye and follow that lead.” She was also advised to favor activities that the parent enjoys as much as the child. The same goes for siblings. Inbar tells ISRAEL21c that he and Rotem play Wii and card games, bake cookies and prepare salads together. “Maybe it’s because he was in the Upsee [when he was younger] and could stand and do things with his hands,” the preteen observes. Debby Elnatan is not your typical mother. When told her son had cerebral palsy and would be confined to a wheelchair for the rest of his life, this Israeli mom decided she would spend years building a device that would allow him to stand on his legs and walk, just like everyone else. In a heart-wrenching stroke of genius, Debby created a harness which allows her and her son Rotem to walk in unison, leaving his hands free to engage in other activities. Now her invention has been launched onto the worldwide market.“When my son was two years old, I was told by medical professionals that he doesn’t know what his legs are and has no consciousness of them”, Elnatan, a music therapist told the daily Mail. Out of the “pain and desperation” with her son’s condition she created the Firefly Upsee Harness, a harness which allows handicapped children to stand and move together with a supporting adult. The special harness is fastened on to the guiding adult at the waist, enabling them to pull the child up to a standing position using another harness attached to the child’s shoulders and legs. Then, the child and adult fasten the shoe bindings which help the two to take steps in unison. Currently, the product’s design suits one leading adult and a 3-8 year-old handicapped child, but due to large demand, the product may be expanded for use by slightly older handicapped individuals. Debby’s innovative thinking has already paid off for nearly 20 families around the world whose children suffer from conditions limiting or inhibiting the freedom of movement. Maura McCrystal, mother of five-year-old Jack, from Northern Ireland, has been one of the first parents to use the product. She told the Daily Mail: “Last Sunday was a significant one for us as a family as it was the first time our son Jack was able to play football in the back garden with his dad, his brothers and our little dog Milly. After a global search for a company to mass-produce her “Upsee”, the Israeli mother chose Northern Ireland-based manufacturer Leckey, which has a long track record in making equipment for children with special needs. 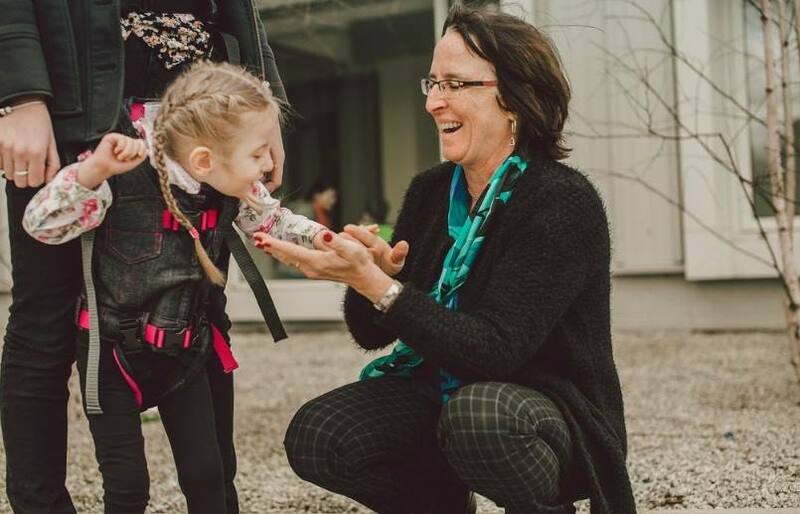 The harness will cost around $540, plus shipping, which makes it an affordable option for parents, who like Debby, want to give their children the chance to walk for the very first time.